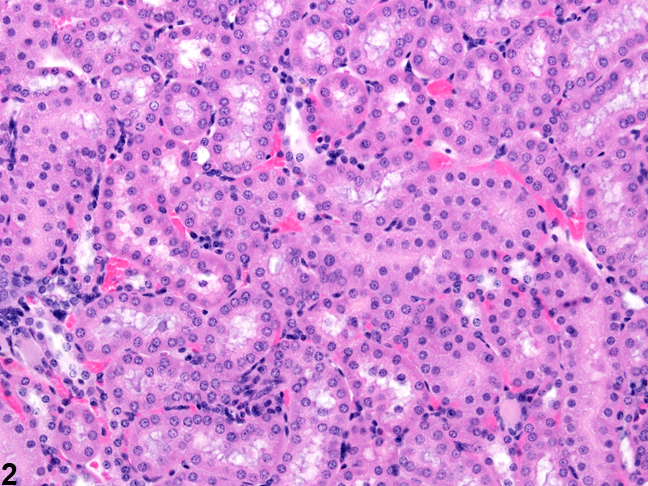 Kidney, Renal tubule - Normal in a male B6C3F1 mouse from a chronic study. 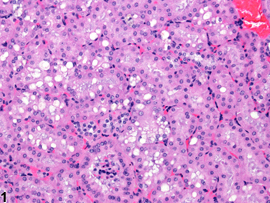 Numerous clear cytoplasmic vacuoles are present in renal tubule cells. 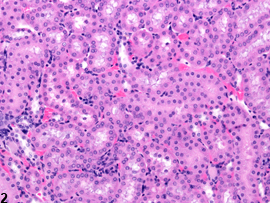 Kidney, Renal tubule - Cytoplasmic alteration in a male B6C3F1 mouse from a chronic study. 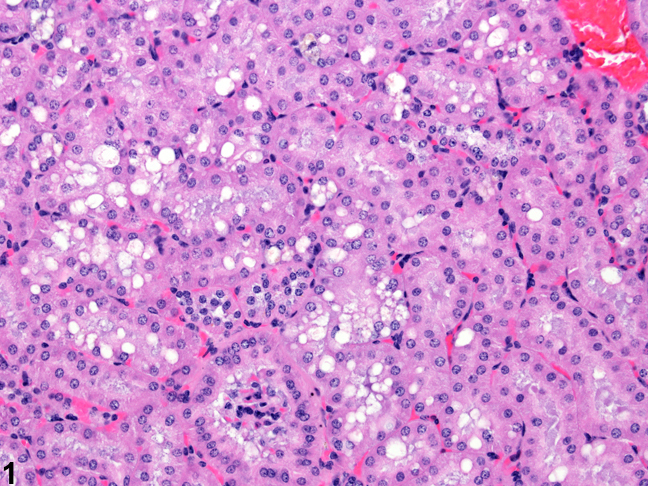 A decrease in the normal cytoplasmic vacuoles is evident in this treated male mouse. Variable cytoplasmic vacuolation in outer cortical tubules of certain strains of male mice is a normal finding ( Figure 1 ). They are thought to represent autophagic vacuoles associated with the normal degeneration of these cells. Some chemicals may decrease the number of vacuoles in the renal tubular epithelium ( Figure 2 ). Cytoplasmic vacuolation that is present as a normal background finding in male mice does not have to be diagnosed. If a decrease in cytoplasmic vacuoles is seen following treatment in male mice (compared with controls), then this finding should be diagnosed as "cytoplasmic alteration" and given a severity grade. Ormos J, Sztriha L, Bóti ZS, Kuthy E. 1975. Electron microscopic and cytochemical study of the vacuoles of regenerating renal tubular cells. Br J Exp Pathol 55:477-483. Seely JC. 1999. Kidney. In: Pathology of the Mouse: Reference and Atlas (Maronpot RR, Boorman GA, Gaul BW, eds). Cache River Press, Vienna, IL, 207-234.